Ellie’s Haven is in a peaceful location on the outskirts of the village of Duloe, a few miles from the seaside town of Looe. Click here to view floor plan. There is paved drive and parking area suitable for several cars. The entrance to Ellie Haven is shared between the house, the Ellie’s Haven office and the sensory studio. The house and garden are private and are for the exclusive use of families enjoying a holiday at Ellie’s Haven. They will not be disturbed or overlooked by Ellie’s Haven staff or families visiting the sensory studio. On the ground floor there are 2 linked bedrooms – one for parents/carers and one for a disabled child. The disabled child’s bedroom is fitted with an assisted bed. It is also fitted with ceiling-mounted hoist. Guests should bring their own slings for the hoist. The disabled child’s bedroom is also linked to a bathroom equipped with another ceiling-mounted hoist and a Gainsborough Henley Hi-lo Powered Bath. There is a further wet-room that incorporates a roll-in shower. The rest of the ground floor is wheelchair accessible, apart from the kitchen and utilities area. There is a large living room with sound system TV that has Freeview and is NETFLIX compatible if you have an account. Upstairs is not suitable for disabled access. It comprises four bedrooms and a bathroom. There is outside CCTV for your and the property’s security. All bedrooms have security locks. The garden is secure and has a path network suitable for wheelchairs. 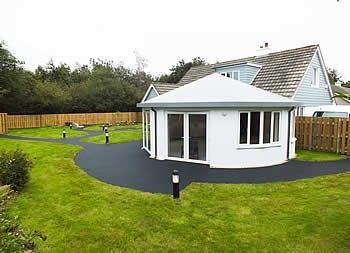 It is mainly laid to lawn and includes a water feature and summer house. Some outdoor sensory equipment is planned.